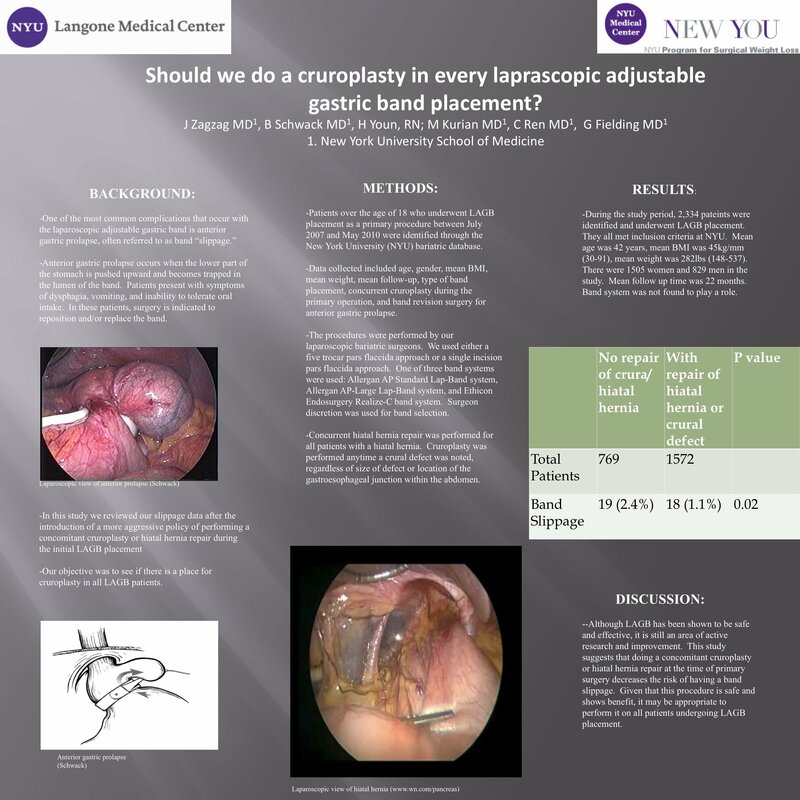 Should We Do a Cruroplasty in Every Laparoscopic Adjustable Gastric Band Placement? Background: Anterior gastric prolapse (often referred to as band “slippage”) is the most common complication of laparoscopic adjustable gastric band (LAGB) surgery for morbid obesity. We have previously shown that concurrent repair of even very small hiatal hernias significantly reduces band revision rates. In this study we reviewed our slippage data after the introduction of a more aggressive policy of cruroplasty for very small anterior crural defects and hiatal hernia repairs when hernias were present. Our objective was to see if there is a place for cruroplasty in all LAGB patients. Methods: Data on 2,334 LAGB patients in a university teaching hospital was collected retrospectively from a prospectively created IRB approved data base (Exemplo) from July 2007 to May 2010. Band “slippage” was defined as a radiographically diagnosed anterior gastric prolapse and/or band migration on an esophagram. Associated clinical findings included dysphagia and severe reflux. Operative reports of all slips were reviewed to assess for concurrent repair of hiatal hernia at primary operation. Results: Data on 2,334 patients included mean age of 42 yrs, mean BMI of 45 kg/m²(30-91), and mean weight 282lbs (148-537). There were 1505 women and 829 males. Mean follow-up was 22 months. There were 37 band revisions(1.59%),36 being in female patients(2.4%). Eighteen of the patients underwent a hiatal hernia repair at primary operation while 19 did not. Revision rate with concurrent hiatal hernia repair was 1.15% (18 of 1,572), while the rate was 2.47% (19 of 769) for no hiatal hernia repair at primary operation (p=0.02). Of these 37 slips, 6 were with the Allergan AP Large system (n=669), 30 were with the Allergan AP Standard system (n=1,383), and 1 was with the Ethicon Endosurgery Realize-C Band system (n=284). Conclusions: Symptomatic LAGB slip is a complex problem. We are further investigating other additional factors including gender difference in relation to weight loss, adjustment style, management of symptomatic reflux and dysphagia in the office, and the use of plication “anti-slip” stitches caudal to the band on the body of the stomach. We will re-evaluate the differences between band systems when we have larger numbers in the Ethicon group. However, the data presented here further supports the notion that concurrent hiatal hernia repair at primary operation results in fewer LAGB revisions. The next logical step is to perform cruroplasty on all LAGB patients. It is a very simple added step with the potential to halve the need for reoperation. Based on our data, we advocate cruroplasty on all LAGB patients.